The KERi™ Nursing Skills Manikin has all the features listed below without being age-specific. Life/form® molding and modeling techniques have given KERi™ an unusually realistic appearance as a woman, or as a man when the wig is removed. Unique visual features reinforce the importance of inspecting patients and noting changes in their appearance. 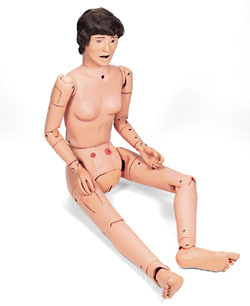 All joints provide maximum lifelike range of motion not found in any other manikin. Life/form® simulations have been included in KERi™ to allow the practice of more than 35 patient care procedures. 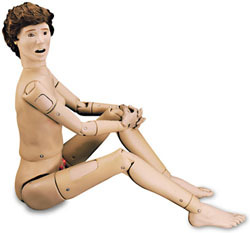 Perfect manikin for all OBRA required training. Full Three-year warranty. For the economy-minded program that still wants the best! The basic KERi™ Manikin provides all the regular features of the KERi™ Complete Manikin, except internal fluid reservoirs have been eliminated for greater economy. 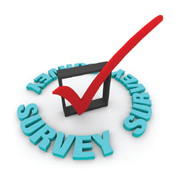 Urinary catheterization cannot be performed on the Basic KERi™. Three-year warranty. The Advanced KERi™ Manikin is fully functional with the addition of a right IV Training Arm (LF03214U) and a left Blood Pressure Training Arm (LF03204U). The Life/form® IV Arm features replaceable skins and latex veins that actually roll when palpated. A realistic flashback confirms proper needle placement, and the shoulder can be used for intramuscular injection training. The Life/form® Blood Pressure Arm reproduces the five Korotkoff sounds and allows the instructor to vary systolic and diastolic levels, pulse rate, volume, and auscultatory gap. Three-year warranty. For auscultation training, the instructor selects from a menu of heart and lung conditions by wireless remote control. The manikin presents itself as a real patient without visible auscultation sites. The student must palpate to identify correct auscultation locations, and will hear different heart and lung sounds as the SmartScope™ is moved to different locations on the manikin. A diagnosis of the condition selected by the instructor can be made by comparing the variations in sounds occurring at different sites - just like a real patient! Lung sounds can be detected at five anterior and 12 posterior locations and students can practice auscultation at six anterior heart sites. 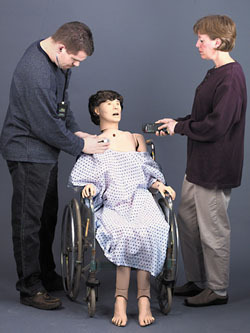 The remote control does not have to be pointed directly at the manikin or SmartScope™ to operate. One remote control will operate multiple sets of SmartScopes™ and manikins simultaneously. Great for group instruction. Listen to the sounds by using either the single- or dual-user headpieces on the SmartScope™ or connecting to an amplified speaker (not included). Range on the unit is up to 100 ft. of remote access. Each trainer includes manikin, one remote control with LCD display, one SmartScope™ with single- and dual-user headpieces, and hard storage case. Requires four "AA" batteries (included). Three-year warranty. Patent pending. Turn your existing KERi™ manikin into an Auscultation Trainer. Update package includes torso with Auscultation sites, remote control with LCD display, and SmartScope™. This wound kit offers a highly detailed variety of disease, pressure and surgically induced wounds to assist practitioners in understanding the treatment of their patients. Whether the practitioners’ education includes clinical nurse training, certified nursing assistant training, surgical technician, or pre-hospital disciplines, it is beneficial to visualize the problems that arise in caring for these wounds. The kit comes with a spray container of odors including sweat and vomit. Comes with 13 wounds and makeup accessories, all packaged in a sturdy carrying case for ease of storage and transport.